Someone in my office recently asked me if I could have two mezuzot checked for her. The one on the left is what the owner of her apartment left on her front door. The one on the right came from her grandmother. Both of these mezuzot are really small (5-6 cm). They seem almost too small to be kosher - meaning that any slight deviation in the height of the letters makes it look questionable. Is there any rule of thumb about the minimum size of the klaf? No there is no minimum size. 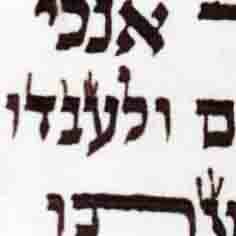 A 6cm mezzuzah is roughly the same size, in regards to k'tiva, as the standard pitzponim tefillin. 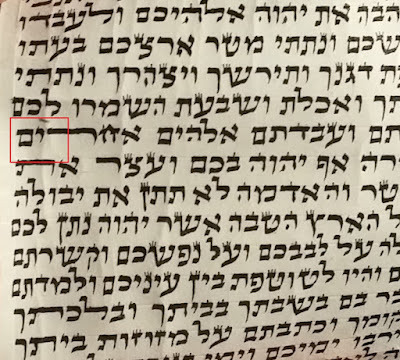 As pitzponim tefillin are becoming increasingly more popular more and more sofrim are learning(or relearning rather) how to write at that size. Before Gasot Batim tefillin of that size were normal, and so I can only imagine that writing at that size was standard fair for a sofer. 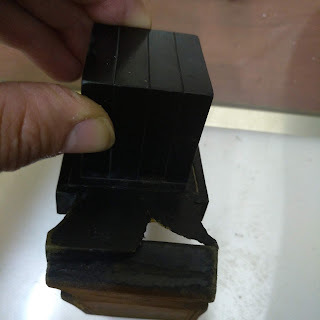 What shimush I have was mainly with old European and early American tefillin of that size. It might have been common to write at that size but good writing at that size was far less common. My rebbi told me that he used to stay up all night repairing b'dieved letters. Might post pictures if people are interested.